Heart-type fatty acid binding protein (H-FABP): a diagnostic marker for early stage AMI and myocardial ischemia, with or without necrosis. 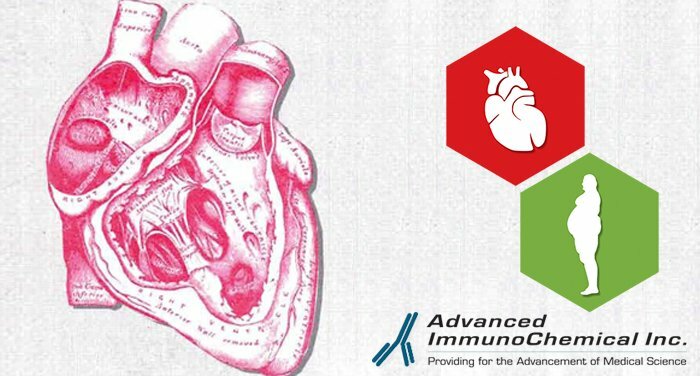 - Advanced ImmunoChemical Inc.Advanced ImmunoChemical Inc.
Home » Assay Notes » Heart-type fatty acid binding protein (H-FABP): a diagnostic marker for early stage AMI and myocardial ischemia, with or without necrosis. Heart-type fatty acid binding protein (H-FABP) is a small (15 kDa) cytoplasmic protein that is abundant in tissues with active fatty acid metabolism, including the heart. Following ischemic injury, H-FABP is quickly released into the circulation via porous endothelial membranes of cardiac myocytes. Myocardial damage can be evaluated in plasma within 1-3 hours after symptom onset. Compared to troponins, the more specific but slower release markers of cardiac injury, H-FABP is a useful tool for rapid evaluation of ischemic injury and size (1). Now available: Advanced ImmunoChemical now offers a unique generation of Anti-H-FABP monoclonal antibodies (MAbs) for the development of highly sensitive, rapid sandwich immunoassays with a linear detection limit of 0.15 to 500ug/L. All recommended MAb combinations were evaluated in small-scale clinical trials with blood samples from AMI patients. Click here to view: Heart type fatty acid binding protein (H-FABP) AssayNotes and product information. The concentration of FABP in skeletal muscle is 20 times lower than in cardiac tissue. Myoglobin occurs in the same content for cardiac and skeletal tissue. This makes H-FABP more cardiac specific than myoglobin, and a useful biochemical marker for the early assessment or exclusion of AMI (1-2). Previous studies have suggested that H-FABP can be used as a reliable marker for hypertrophic and dilated cardiomyopathy, heart failure, early estimation of infarct size, early detector of postoperative myocardial tissue loss in patients undergoing coronary bypass surgery, stroke, and obstructive sleep apnea syndrome. (3-7). Moreover, it appears H-FABP is a marker of cardiac injury in the early asymptomatic period in patients with metabolic syndrome (8). See our other cardiac markers and metabolic syndrome products. Available online. 1. J. Storch and A.E. Thumser. The fatty acid transport function of fatty acid binding proteins. Biochim Biophys Acta 1486 (2000). p. 28-44. 2. Zhang F, Lucke C, Baler LJ, Sacchettini JC, Hamilton JA. Solution structure of human intestinal fatty acid binding protein implications for ligand entry and exit. J. Biomol NMR 1997 Apr (3):213-28. 3. Azzazy HM, Pelsers MM, Chritenson RH. Unbound free fatty acids and heart-type fatty acid binding protein; diagnostic assay and clinical applications. Clin Chem 2006; 52: 19-29. 4. Wu A. Cardiac markers. 2nd edition, 2003, Humana Press. 5. Wodzig KW, Kragten JA, Hermens WT, Glatz JF, van Dieljen-Visser MP. Estimation of myocardial infarct size from plasma myoglobin or fatty acid binding protein. Eur J Clin Chem Clin Biochem. 1997 Mar. 35 (3), 191-8. 6. Ishii J, Nagamura Y, Nomura M et. al. Early detection of successful coronary reperfusion based on serum concentration of human heart-type cytoplasmic fatty acid binding protein. Clin Chin ACTA 1997 Jun 27; 262 (1-2):13-27. 7. Petzold T, Feindt P, Sunderdiek U, Fischer Y, Gams E. Heart-type fatty acid binding protein in the diagnosis of myocardial damage in coronary artery bypass graft patients. Eur J Cardiothorac Surg 2001 Jun; 19 (6): 859-64. 8. Lescuyer P, Allard L, Hochstrasser DF, Sanchez JC. Heart-fatty acid binding protein as a marker for early detection of acute myocardial infarction and stroke. Mol Diagn 2005; 9(1):1-7.